Following anecdotal reports last week that the Trump administration had started "using children who have been taken from their parents as pawns—to get detained immigrants to agree to their own deportations and drop their asylum cases," an Immigration and Customs Enforcement (ICE) form obtained and published by CNN and NBC News confirmed the directive. "A child should never be held hostage to force a parent to relinquish their legal right to seek asylum." I am requesting to reunite with my child(ren) for the purpose of repatriation to my country of citizenship. I am affirmatively, knowingly, and voluntarily requesting to return to my country of citizenship without my minor child(ren) who I understand will remain in the United States to pursue available claims of relief. As NBC explained: "Asylum law dictates that immigrants should be allowed to make an asylum claim before a judge even if they have been given an order of deportation. Immigration rights advocates say forcing parents to choose immediately between leaving the country with or without their children means they are effectively prevented from asking for asylum." At the top of the form, immigration agents are instructed to read the two options, in a language detainees understand, to anyone who has a deportation order. 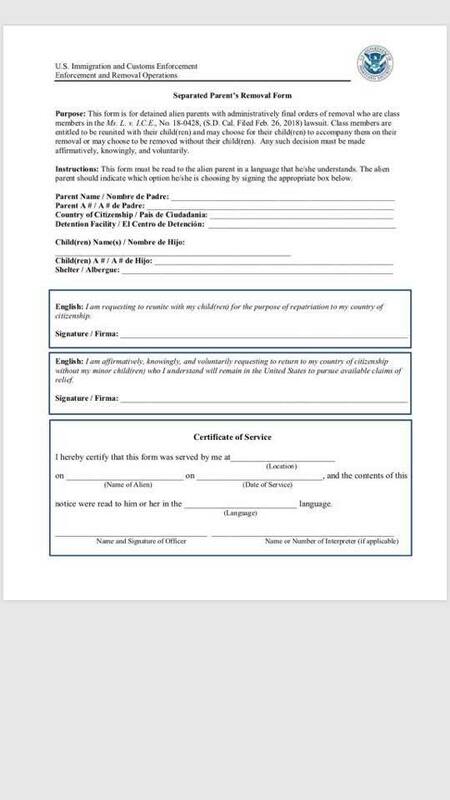 However, an SPLC attorney told Nick Valencia at CNN that some asylum-seeking parents are being pressured to sign the form before they see a judge and, in some cases, even before they have a removal order. Lee Gelernt, an ACLU attorney who is leading a class action lawsuit for family reunification, told NBC, "We are seeing cases where people who have passed credible fear interviews and have pending asylum claims are being given this form." Those who pass credible fear interviews are typically released on bond while they move forward with an asylum application, though as Mother Jones reported Sunday, ICE also has been "denying bond to some parents who have been separated from their children and are eligible to apply for asylum"—an "unusual move, which can extend the amount of time the families remain separated." Following that report, and after months of similar allegations documented by immigrant rights advocates, a federal judge ruled late Monday that the Trump administration cannot indefinitely detain asylum seekers who are awaiting immigration hearings. While the ruling was declared a victory for immigrant rights, activists remain alarmed by the directive that essentially prevents separated families from applying for asylum. As Wendy Young, president of Kids in Need of Defense (KIND), put it, "A child should never be held hostage to force a parent to relinquish their legal right to seek asylum." The developments come as Attorney General Jeff Session on Tuesday rescinded a Justice Department guidance that allowed refugees and asylum seekers to work, while Senate Democrats demand answers about some 2,300 separated children who remain in U.S. government custody, and as a growing number of politicians and activists add their voices to an angry chorus demanding that the Trump administration immediately #AbolishICE.